Copwatch Santa Ana hasn't added a story. Support our troops! Donate to the Anti-Fascists who stood up to the KKK in Anaheim! On February 27, a courageous group of anti-fascists gathered to counter protest the KKK rally in Anaheim, CA. When the pigs came, they ended up targeting and arresting the counter protesters, many of them Black and Brown people, and not the racists who instigated the confrontation/violence in the first place. Not surprising. The anti-fascist comrades who got arrested are in urgent need of some real solidarity! That’s why we need to raise BIG MONEY for them. Your donations will go towards any medical or legal costs associated with their injuries and arrests from that day. 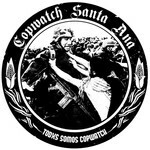 Copwatch Santa Ana and the Los Angeles Anarchist Black Cross will work together with other local anti-fascist/anti-racist groups to divide the money appropriately to the arrestees. Local folks are also organizing benefit shows and other actions to support the arrestees. Check out "Copwatch Santa Ana" on Facebook and Instagram for updates. An injury to one is an injury to all. Support our troops! Copwatch Santa Ana hasn't posted any updates yet. Copwatch Santa Ana is managing the funds for this campaign.